A French translation has been written between the lines of the main Latin text of this Psalter. Such a bilingual manuscript might have been intended for an English cleric who knew Latin but not French, or for a novice from a Norman family who knew French but did not yet know Latin. It was probably made at Peterborough for use at the nearby abbey at Crowland. St. Guthlac (d. 714), hermit of Crowland, appears emphasised in green ink on 11 April, and has an octave on 18 April; his translation is also emphasised (23 August). 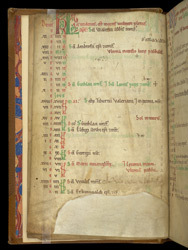 These and other entries such as Guthlac's sister, St. Pega (8 January), suggest a that the calendar was written for the Benedictine abbey of Crowland.